A long and often rough walk on mainly pathless moorland visiting a number of summits including Great Stony Hill, Dead Stones and Burnhope Seat. When, shortly after leaving Burnhope Reservoir, it began to rain and the cloud began to settle on the tops I thought I was going to be in for a fairly wet and miserable day. Hoping optimisically it was just a brief rogue shower I climbed Grasshill Causeway all the way up on to Coldberry End, not far from the summit of Great Stony Hill. The route I was following, taken from John & Anne Nuttall’s ‘Mountains of England and Wales’, involves a lengthy there and back again excursion from Coldberry End to bag the summit of Three Pikes. Their description of this part of the walk as being by far the roughest of the route did make me think twice about heading out to Three Pikes as I didn’t really fancy it in the prevailing conditions. In the end the fact that Three Pikes was the only summit on my itinerary currently under the cloud level made my mind up for me and so I girded my loins and set off across the moor for my first top of the day. It was a good decision. For a start the ground was nowhere near as bad as I expected. This may have been due to the dry conditions earlier on in the spring or it may be that I’m just used to walking on this sort of ground but whichever was the case I made it to Three Pikes without problem. Against expectation the weather also began to improve and by the time I reached the top of Three Pikes the cloud had begun to lift and there was even a few brief patches of sunlight in the valley. The top of Three Pikes (surely a misnomer if ever there was one) is basically a flat peaty plateau. The cairn on the western ‘edge’ by the OS spot height did however have a good view down to the remote farmsteads of Harwood and south west over Cow Green Reservoir towards Mickle Fell. The Nuttall’s claim the highest point is marked by a small cairn 100 yards to the east but if it is any higher it must only be a matter of inches. From Three Pikes I retraced my steps back to Coldberry End from where it was a short easy climb on grass to the top of Great Stony Hill. The presence of some modest rocks near the summit (rare in the North Pennines) meant that, unlike Three Pikes, Great Stony Hill partially lived up to its name. The summit itself was marked by a trig point and cairn both of which were sat on a small grassy ridge. Some quite substantial areas of peat hags had to be negotiated between each of the subsequent summits and I found that despite their claim to the contrary the conditions underfoot on the way to Three Pikes was emphatically not the roughest section of the route. Had it not been for my gators I may well have lost a boot in one particularly sticky bog on the way to Harwood Common. The latter was, like Three Pikes, a flat peaty top covered in cotton grass. The view from the summit now included the Dun Fells who had emerged out of the cloud. The very top of Cross Fell however remained under cover for the duration of the walk. Burnhope Seat is the highest fell in the North Pennines east of the Tees / Tyne watershed and was, until 1974, the highest point in County Durham. The Nuttall’s give the highest point as being the trig point at 746m which is the only spot height on the OS Explorer map. However the OS Landranger map gives a 747m spot height about a quarter of a mile to the east where a small cairn can be found. It is unusual for the normally thorough Nuttalls to make a mistake, especially when it does look fairly obvious from the trig point that there is higher ground to the east. 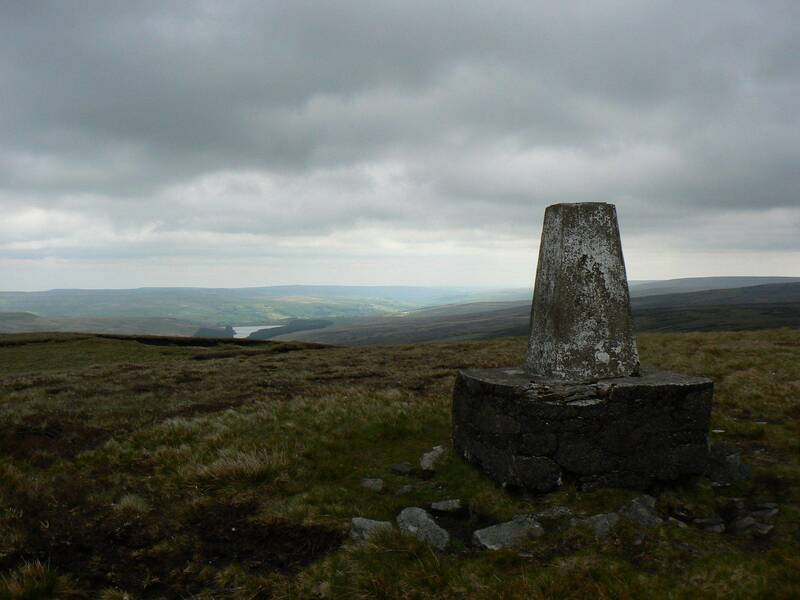 Regardless of which point is the highest they are both worth visiting if you happen to be up on Burnhope Seat, the trig point has a good view back down to Burnhope Reservoir and Upper Weardale whilst the 747m spot height provided the first views of the day down into South Tynedale. Dead Stones was the last summit of the day and it proved to be the most memorable. The top is marked by a fine example of a North Pennine currick which, at the moment of my arrival, was also the meeting place for a congregation of sheep. The unique thing though about the summit of Dead Stones was the stone shelter just a few yards from the summit. Not just your average stone shelter this fine construction had an outer entrance, a porch complete with wooden bench, and an inner room which had been roofed in stone. I’ve never come across anything like it and was more than happy to sit on the wooden bench to eat my lunch and enjoy the view. From Dead Stones it was a near 4 mile walk back to Burnhope Reservoir along another peaty moorland ridge, towards the end of which was the remains of Highwatch Currick with its attendant trig point. The wind, which had been strong all day, was blowing so strongly at Highwatch Currick I struggled to stand still and it took me numerous attempts to get a photo in focus. The final descent featured some nice views of Upper Weardale and provided a pleasant conclusion to what had been a fairly tough walk. For most of the walk I’d felt lucky that the afternoon rain had not materialised and if anything the weather had actually seemed to improve as the day went on. These are very solitary hills and, after passing a farmer on Grasshill Causeway, I didn’t see a single person until I got back to Burnhope Reservoir. I did see plenty of bird life though and I cannot think of anywhere that I’ve seen and heard as many golden plovers as I did on this walk.